Add special sparkle to any craft project. 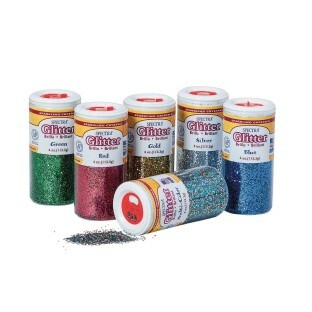 Spectra® glitter 6-color assortment in 4 oz. shaker-top dispenser jars. Sprinkle over glue or mix in paint to add special sparkle to any craft project. Set includes: red, green, blue, multi, gold and silver. Non-toxic. Conforms to ASTM D-4236.